Join us as we journey north from Fukuoka to Tokyo taking in five matches along the way. From the history of Hiroshima to the majestical Mt Fuji, to the bright neon lights of Tokyo, this snapshot of Japan is one you won’t want to miss! Our 11 Day Trails of Japan Tour takes in Australia’s final two pool matches as well as three other block busting encounters. After two matches in the Kyushu region we will make our way to Hiroshima, a city decimated after the first atomic bomb was dropped on August 6th 1945. Here we will visit the Hiroshima Peace Memorial and Atomic Bomb Dome as well as a ferry trip to the island of Miyajima and visit ‘The Great Torii.’ We will next make our way to Hakone where we will take a day tour to see the iconic Mt Fuji. The tour then finishes with a bang as we watch Australia take on Georgia, England clash with France and then tournament hosts Japan battle Scotland. 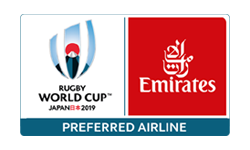 As the Licensed Tour Operator of Rugby Australia, We Love Rugby enjoy unprecedented and exclusive access to members of the current Australian squad and where possible in the itinerary access to training sessions. All our 2019 Tours will include panel sessions featuring Rugby legends and members of the current Australian squad. For Rugby World Cup 2015™, England, our guests mingled with Drew Mitchell, Adam Ashley-Cooper, Kurtley Beale, Quade Cooper, Sean McMahon and many more at numerous functions.